The event will gather tons of goods from many leading brands which will be sold in the very special price up with special session "Super Shock Price"
October 03-05, 2018: Time 11:00-22:00 hrs. October 06-07, 2018: Time 10:00-22:00 hrs. “SmartHeart presents Thailand International Pet Variety”, episode 8, the leading pet exhibition in Thailand welcomes all pet lovers and their adorable pets to the exciting fabulous pet competitions and incredible pet activities, Being along and show-off the untapped potential of your pets to the show, enjoy shopping caravans of discounted of pet products, such as unique accessories, lovely costumes and health care goods from over 200 exhibit booths, covering 10,000 sq.m. Let’s find out the new outstanding experiences of pets showing only in this event! 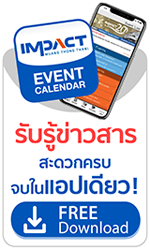 The event features OTOP products and services from each village to serve travel and tourism in Thailand. Show Manager: Chan 29 Co.Ltd.